Domestic objects and the accessories in our homes will become important too. They will be the intimate language for individuals to express their solidarity with environments and political issues. Issues they can involve themselves in by merely observing the plight of our planet on TV. Bric-a-brac that displays a social status and the ability to possess, will be replaced by humble items such as wood, ceramics, metal, or fabric. Small necessary things, or even some not so necessary. Objects that are simple clear and human. They will stand in the yawning gap between the richness of the exclusive object, and its crass mass-produced plastic imitation. Their simple strength will correct an imbalance in the market. There will come to our homes a sense of survival and a need for calm and honesty. These accessories will be sold. Simon Morgan is one of several European designers armed with an extraordinary determination to realise a communication and cultural progression. Designing ‘concrete’ practical and solid objects will achieve this. For this reason, Morgan is a part of the design movement entitled ‘Solid’. Inevitably, this innovative group is centred in Milan. Where else would you find active and successful entrepreneurs involved in experiments in commercial industry and culture? Teh first meeting of Solid took place in December 1985 and its principles were set later, realising themselves in the first presentation of products in 1986. From that date, the solid group became official, producing small but essential objects for the house. A notable Italian kitchen furniture manufacturer brought it together, and sponsored Solids’ eight designers. Morgan works out of his studios in Zurich, Switzerland and Milan. This studio (rather tongue in cheek) called 2D 3D implements graphic and industrial design projects. He, together with his partner, support themselves and their families developing Hi-tech products for large international corporations. However, the design movements such as Morgan’s ‘Solid’ and other like Memphis, Alchimia, and more recently Progetto Oggetto are all the results of self motivated initiatives. These pioneering projects are conserved and worked on by mainly multinational teams of designers, all of whom congregate in Milan. They all found sponsors for their ideas in this city in Northern Italy. It is in this rich climate that the seed of change can bear its fruit for other barren western culture to pluck. The consequences of this budding activity have allowed change to show itself in one place, for the world to look before others dare. It is as if all realise something needs to be done, but all wait for Milan to put its best foot forward first. The explosion of decoration in the early 80s is now over and the fantasy world will be replaced by forms such as Morgan’s. Solid forms full and pure, with fixed rules and almost always natural. ‘Solid’ will bring integrity back to simple household objects. Accessories such as small table utensils. It will be these simple and humble household objects that will be taken into the home by this new era’s consumer. New images will be cherished in a fork or in a coffee cup. Design will bring an extraordinary instrument of figurative communication back onto our lives. Less exclusive and affordable little things that generate our everyday life. 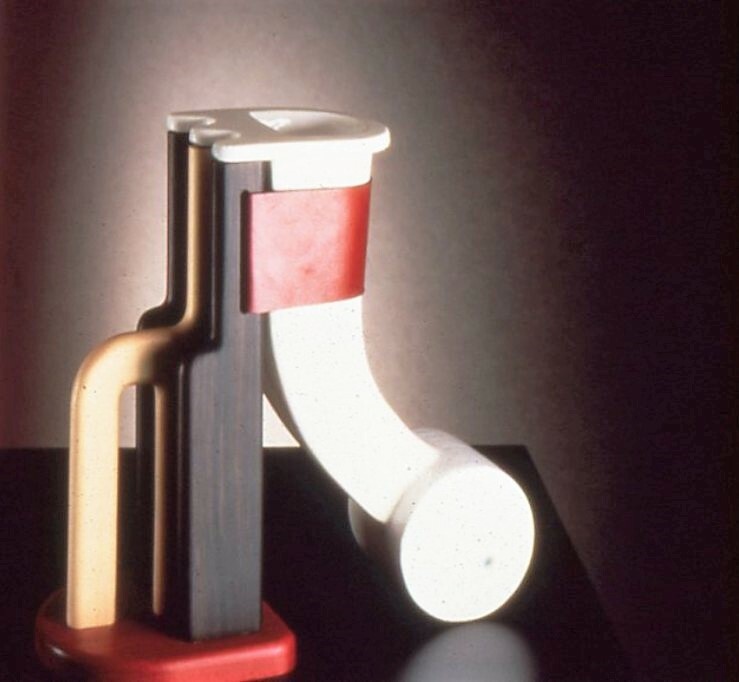 Three items in the collection of product developed by “Solid” a design movement established by Simon Morgan and a mix of European designers in 1986 in Milan Italy. These and other items in the collection were featured in an article by Mark Lewis published in 1993 as part of a piece reflecting on the innovations in design that carried forward to subsequent eras. Simon, a very close friend of Marks, after leaving Kingston Polytechnic where they met, went to work in Italy and later France. 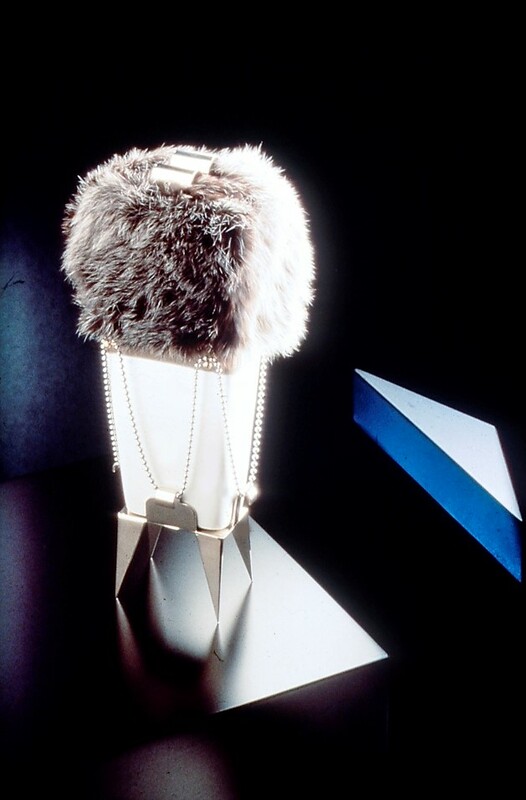 He worked with George Sowden and Ettore Sottsass developing product for Olivetti and furniture and accessories for the Memphis group of designers in 1981. Our work of that era set the tone for the “Postmodern” design movement of the 80’s. Simon died in tragic circumstances. Simon Morgan 1958-1999. The entire Memphis collection was purchased over the years by David Bowie. His collection was activated by Sotherby’s in 2017.